love this podcast!! I am so glad I found it and cannot wait for more episodes! The "WHOA That's Good" podcast, welcomes you into meaningful conversations with authors, athletes, musicians, speakers and stars of film and television in search of the answer to just one question. What is the best advice you have ever been given? 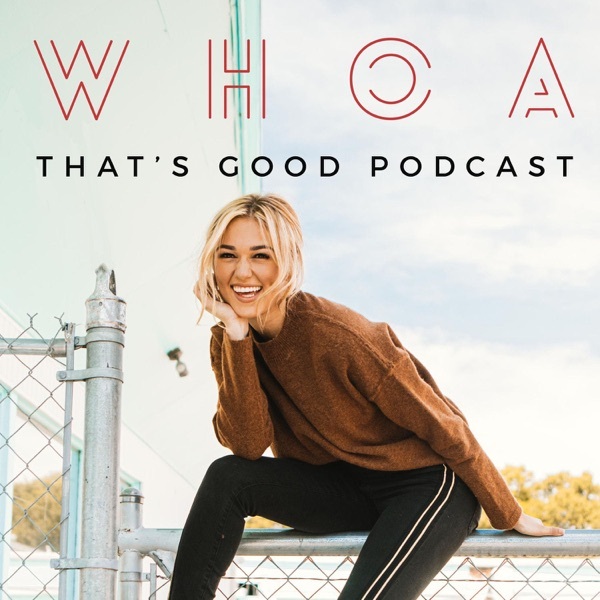 Hosted by Sadie Robertson, best selling author, founder of Live Original, and star of A & E's Duck Dynasty & Season 19 of ABC's Dancing with the Stars, this fun and lighthearted podcast is sure to leave you saying, "Whoa That's Good!" Season one premieres on September 12th! Sadie is joined on the podcast by television personality and author, Elisabeth Hasselbeck. Elisabeth is known from her roles on Survivor, The View and FOX & Friends. She shares advice her dad gave her about the fear of letting people down and how her father’s love helped her understand how God sees her. Sadie interviews Olympic gold medalist Shawn Johnson and her husband and former NFL player, Andrew East. Join them as they discuss how they learned to cultivate 100% transparency in their marriage and on social media, their story of falling in love, and why they keep their relationship full of laughter! Sadie welcomes Emma Jenkins to the podcast. Emma is a speaker and writer, who shares her advice from her mom about how fearing people will keep you from God's purpose for your life. She also shares her amazing passion for the Bible and how to dance with Jesus in your everyday life. Sadie welcomes her mom, Korie Robertson to the podcast for her first full length conversation. Korie shares advice her dad gave her about the blessings of family, faith and relationships and how these are the things no one can take away from you. Sadie welcomes artist Francesca Battistelli to the podcast. Francesca shares advice she received from her mom, on being willing to try new things while being afraid. She shares stories about the insecurities and fear she felt early on in her career as a guitar player and how she was able to overcome them. Her latest project is called Own it. Sadie welcomes Chrissy Metz, who plays Kate Pearson on the NBC drama,This Is Us, to the podcast. They discuss her struggle to make it in Hollywood as an actress, why it is important to believe in other people until they are able to do it for themselves, and her new movie, Breakthrough, which releases on Easter 2019. Sadie welcomes Caitlin Crosby to the podcast. Caitlin is an actress, singer, songwriter, entrepreneur and founder of The Giving Keys. They discuss the beauty of flaws and imperfections, and how those can lead to your unique calling and vision. Sadie welcomes her best friend, Laney Redmon to the podcast. They discuss the idea of striving to keep something that was never earned and how everything in life should be viewed as a gift. Sadie Robertson wraps season 1 of her podcast with a special visit from her brother, John Luke Robertson. He shares the best piece of advice he has ever received and how the power of love and his thirst for learning has impacted his life. Sadie visits with Cory Asbury, who is a worship leader, songwriter and a pastor. He joined the Bethel Music Collective in 2015. Cory serves at Radiant Church in Kalamazoo, Michigan with his wife Anna. He exploded on the scene in 2018 with his massive hit song, Reckless Love, going to #1 at radio in only seven weeks. This is a song the church will be singing for years to come! Bob Goff is one of the most inspiring authors and speakers in the world today. His latest book, Everybody Always!, is already on the New York Times Bestseller list.